This time on Go Forth And Game I’m joined by Louis Perrochon the designer of Startup Fever. Startup Fever was recently published through Kickstarter and I thought it would be cool to talk to Louis about his game and how he designed it. Tom: Louis, tell us about yourself. Louis: In the terminology of Startup Fever, I am a nerd, living in Silicon Valley for about 15 years now. Tom: What’s your gamer pedigree? What got you started in gaming? Louis: As a kid, I played some classic two people boardgames, and one Swiss card game called “Jass”. It’s basically the national game of Switzerland. There are even competitions on TV. Then I didn’t play much of anything for years. Until about 10 years ago I came across Settlers of Catan, a game that I still love and play. Tom: ‘Jass’ looks interesting. I need to check it out some more. Ok, so now for Startup Fever. How did it come about? Louis: A few things happened in parallel. I was basically watching how some people frequently changed jobs from Startup to Startup, and how much money changed hand on these so I was thinking of a way to model this. At the same time, Mob Ties was funded on Kickstarter and I was just fascinated by the combination of Kickstarter and niche board games. Mob Ties is a fantastic game, starting with the art, the mechanics, and the theme. But I think the chances of a publisher picking it up and leaving it unchanged would have been small. Tom: What about it changed from initial concept to final product? Louis: Initially, I just played around with revenue generation and hiring/vesting/poaching. Once the basic mechanic was solid, I added a bunch of other stuff to it, but most of this was removed over time, as it was just too complex. It’s still a more complex game than I originally envisioned. 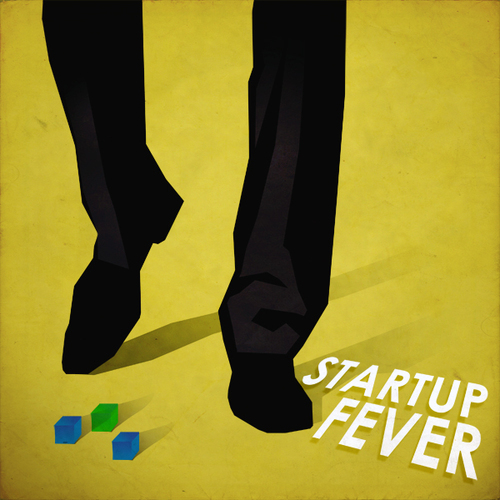 Tom: Why did you choose to Kickstart Startup Fever? Louis: Kickstarter provides two main things: Funding and a market test. Because of the funding, the designer can take on some risk with a game. You get the “director’s cut” of the game, instead of the mass-market version. 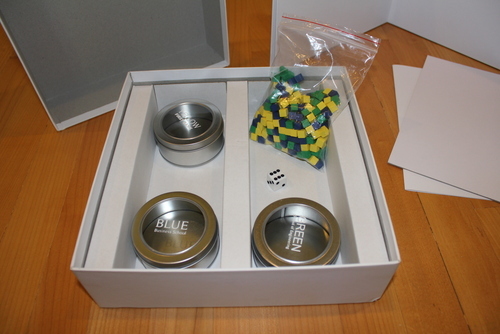 In Startup Fever, you get tin cans to store your wooden pieces. The second thing Kickstarter gives you is a first sanity check if what you plan to do is actually worth-while. Once you have hundreds of backers, you will be a lot more certain you are doing something worth doing. Louis: In my case, the theme inspired the basic mechanic. This was the time where Facebook was rumored to pay millions of dollars to Google employees. That’s the key mechanic of the game. You hire an employee, and this other player comes along and pays 6 times what you just paid, and your employee is gone. The rest of the theme, Suits, and Nerds, and Big Suits and Big Nerds only came a bit later. The art work came only at the end. Louis: Simplifying the rules…. 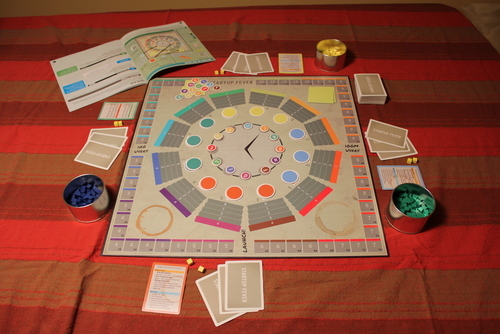 A reality-inspired game is so much simpler than reality, and you have to cut and cut and cut. I removed a lot of stuff, but I eventually gave in and increased manual size to 12 pages, because on 8 pages, the font was so small…. And I sneaked some of the cut-out stuff back in as an extension, that I gave to the Kickstarter backers. Tom: Playtesting seems to be a mixed bag. While absolutely necessary, it can be slow and difficult. What is the hardest part of playtesting a game? Louis: Right now, I try to spend some time on all the other things I missed for a year. And I have half a dozen of games, some of them other Kickstarter projects, unplayed: Dark Horse, Quebec, Eclipse. 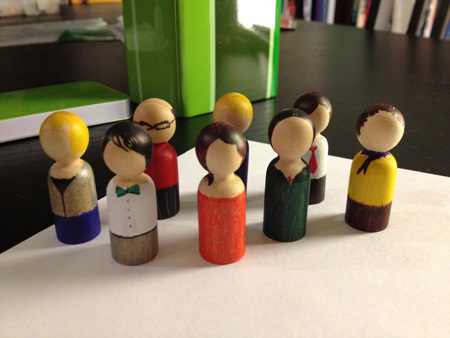 Louis: I admire all the small, independent, hard-working people who create amazing board game experiences. Some of them are designers, but not all of them. Look at Dan Yarrington from Game Salute who is trying a different distribution model with his preferred stores. I partner with him largely for that reason. Also the folks over at the Geek. They built this amazing resource. I interacted with Chad Krizan, and it often felt like I am the only one. And of course Gary Simpson, who created beautiful art for a game called “Startup Fever”. Tom: What is your current favorite game? Louis: The other night, we played Dark Horse last night and I desperately want to play again. It’s a mixture of Settlers (towns, cities, road/rails) and Alien Frontiers (roll dice and place them), both of which are high on the play next list. Tom: Do you have any game designs in development? Louis: Not right now, but the other night I had another idea. I don’t have much time right now, but this could work. Tom: Talk briefly about your artist. The amazing thing is that we never met in person. Gary Simpson is an avid player and a great artist and he has worked on a few other games. I liked his work, and I liked his experience with other games, and I have not been disappointed. I love the art of Startup Fever. Gary deserves all the credit for such a beautiful game. 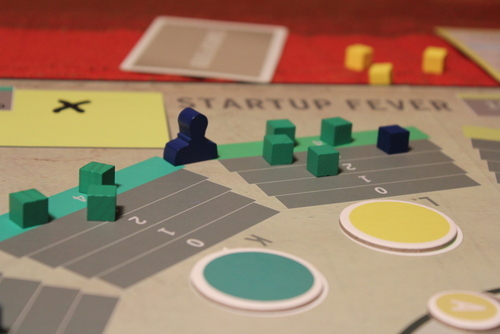 Tom: Startup Fever has some great bits. I particularly like the tins for the cubes. I know Panda Manufacturing did your production. Talk briefly about Panda. I am hoping to get an interview with them this year. Did you have any problems with production? Louis: It took a lot longer than thought, but it was entirely delays in getting the final files to Panda. Once Panda had the files, things moved very smoothly and on schedule. I cannot say enough good things about Panda. Panda has been fantastic and the quality of their work is outstanding. They are players themselves, and they know what matters. At this point, I am disappointed when I open a new game and the quality of the component is less than what I am used from Panda. I can only recommend them. Tom: How can people order/get a copy of Startup Fever? Louis: www.startupfever.com has the link. Tom: Any other links you want people to check out? Thank you for being my guest Louis. It was a lot of fun. I’m looking forward to seeing what you have in store for us. And thank you, dear readers, for spending time at Go Forth And Game. Please leave a comment and come back soon.